Following lectures on urban plants, I was curious to know more about the significance of a lack of understorey/ shrub/ herb/ ground layer in urban forests. Hence, this post is dedicated to answering two questions: Why is there a lack of understory/herb/shrub layer in urban forested areas, and what are the implications of this? Why is there a lack of understory/herb/shrublayer in urban forested areas? The effect of urbanisation on the types and patterns of vegetation in the city is very pronounced, and has resulted in its own unique mix of species, community compositions and structures. In terms of structure, urban forests have a more simplified structure. There is often a lack of understorey, herb/shrub layer as well as ground layers. For native species in the ground layer of parks, this is attributed in part to the high levels of disturbance caused by making paths and maintaining vegetation (Guntenspergen et al., 1997). There is high maintenance of branching vegetation like shrubs in the understory, to increase visibility in green spaces, as well as to look aesthetically pleasing. Increased security linked to increased visibility is more attractive and important to residents and also visitors of the city (Sieghardt et al., 2005). Also, heightened levels of disturbance like human trampling resulted in poorer root development and stem growth (Bhuju & Ohsawa, 1998). Other reasons include disturbance caused by construction of trail or trekking paths. Including Singapore, as nature trails become more popular as a recreational activity in developed countries, disturbance by trampling might become increasingly detrimental to the diversity and growth of the understory because of soil compaction (Bhuju & Ohsawa, 1998). The number of people who live in the vicinity of forest stands is also important in estimating the amount of trampling that affects understorey health, because of increased recreational visits, as demonstrated in Greater Helsinki, Norway (Malmivaara et al., 2002). Singapore, as a highly populated area with a population of almost 6million compared to 1.4million in Greater Helsinki probably means that there is higher frequency of visitorship in forested areas, and hence greater disturbance. Trampling seems to affect plants more than invertebrate fauna, and among invertebrate fauna, spiders suffer the most from trampling effects (Duffey, 1975). In New York City, studies done in several urban parks show that disturbances caused by traffic and fires resulted in the lack of ground layer and seedlings (Guntenspergen et al., 1997). The presence of a shrub layer increases or maintains the biodiversity in the understorey by being competition for fast-growing opportunistic species that might otherwise take over places with large canopy gaps that let sunlight reach lower heights of the forest (Beckage et al., 2000). This allows for other plants with different life histories and trade-offs to grow, resulting in a more diverse species community. With increased diversity of flora, this increases the number of different niches that can be exploited by animals like arthropods and birds in the understorey. The understorey has a big role in nutrient recycling as well, cycling a greater proportion of its total nutrient (N, P, Ca, Mg, K, Zn, Cu) annually compared to overhead vegetation (Yarie, 1980). A thick understorey can also act as a buffer that softens edge effects especially when forests are next to incompatible land-use, which is often the case in Singapore (Smardon, 1988). Hence, with reduced or absence of these layers in urban forests, forest dynamics are significantly altered, and such benefits are not available. However, the lack of an understorey has its own benefits too. In a forest study in West Japan, canopy pine trees were shown to suffer from reduced physiological stress when there is a lack of understory because of a lowered level of competition for water and nutrients (Kume et al., 2003). Dense understories also proved to retard forest succession in a meta-analysis by Royo & Carson (2006). A study by Guntenspergen (1997) did not even show significant differences in shrub/ herb layer in terms of presence, composition nor species diversity across an urban gradient. They attributed this to lower visitorship of the forest fragments. 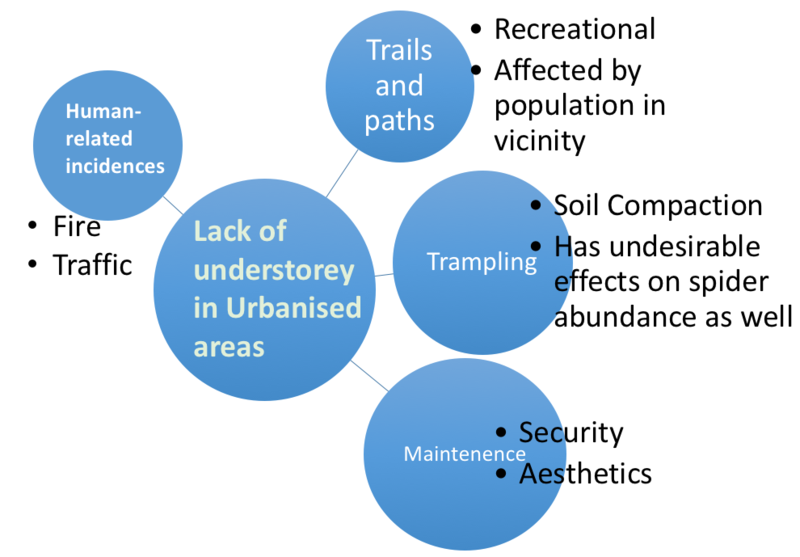 As for the understorey component in the same study, there were changes in composition, but the authors attributed it to a combination of both fragmentation in addition to disturbance in urban areas. Beckage, B., Clark, J. S., Clinton, B. D., & Haines, B. L. (2000). A long-term study of tree seedling recruitment in southern Appalachian forests: the effects of canopy gaps and shrub understories. Canadian Journal of Forest Research, 30(10), 1617-1631. Bhuju, D. R., & Ohsawa, M. (1998). Effects of nature trails on ground vegetation and understory colonization of a patchy remnant forest in an urban domain. Biological Conservation, 85(1-2), 123-135. Duffey, E. (1975). The effects of human trampling on the fauna of grassland litter. Biological Conservation, 7(4), 255-274. Guntenspergen, G. R., & Levenson, J. B. (1997). Understory plant species composition in remnant stands along an urban-to-rural land-use gradient. Urban Ecosystems, 1(3), 155. Kume, A., Satomura, T., Tsuboi, N., Chiwa, M., Hanba, Y. T., Nakane, K., … & Sakugawa, H. (2003). Effects of understory vegetation on the ecophysiological characteristics of an overstory pine, Pinus densiflora. Forest Ecology and Management, 176(1-3), 195-203. Malmivaara, M., Löfström, I., & Vanha-Majamaa, I. (2002). Anthropogenic effects on understorey vegetation in Myrtillus type urban forests in southern Finland. Disturbance dynamics in boreal forests: Defining the ecological basis of restoration and management of biodiversity. Royo, A. A., & Carson, W. P. (2006). On the formation of dense understory layers in forests worldwide: consequences and implications for forest dynamics, biodiversity, and succession. Canadian Journal of Forest Research, 36(6), 1345-1362. Sieghardt, M., Mursch-Radlgruber, E., Paoletti, E., Couenberg, E., Dimitrakopoulus, A., Rego, F., … & Randrup, T. B. (2005). The abiotic urban environment: impact of urban growing conditions on urban vegetation. In Urban forests and trees (pp. 281-323). Springer, Berlin, Heidelberg. Smardon, R. C. (1988). Perception and aesthetics of the urban environment: Review of the role of vegetation. Landscape and Urban Planning, 15(1-2), 85-106. Yarie, J. (1980). The role of understory vegetation in the nutrient cycle of forested ecosystems in the mountain hemlock biogeoclimatic zone. Ecology, 61(6), 1498-1514. Hi Jasmine, interesting post! I am quite curious what you mean by urban forests. Are they forests that occur within a city? Are they just any form of streetscape? Or a heavily vegetated area? If you’re referring to streetscape, it is understandable that there is a lack of understorey layer because they are usually not planted. In Singapore, there are nature ways that incorporate layered planting, creating green corridors that resemble that of a forest structure. Estella has written a really nice post on Singapore’s nature ways last year. If you’re talking about a secondary forest located within a city, I agree that high visitorship may cause trampling and affect the understorey layer. I didn’t think about the impacts this may potentially have on encouraging the spread of invasive species in a forest, so that was a good point! Trampling also damages the roots of rare and old plants and kills seedlings, reducing the recruitment of important plant species including large canopy trees. Having designated pathways like boardwalks and education will be beneficial. Hi Li Fang, thank you for your comment. My post was mainly about urban forests rather than vegetated streetscape! I agree with you that the lack of understorey might be due to no one planting them, but what about seeds that are e.g. wind-blown to these soils that might be a suitable place to grow? Thanks for bringing my attention to Estella’s post. Indeed, nature ways seems to be a great way to introduce complexity into urban forest-scape, although, as she pointed out, nature ways close to roads still does not seem to be an ideal habitat for forest species. Increased vegetation here might end up being hiding areas or hotspots for synanthropic animals or pests that the urban population might not be too supportive of.